Best Cat Tree Reviews – Find the best automatic litter box here! Is your cat an indoor kitty? Does she seem bored and lethargic most of the day? Then your cat will love you for buying her a cat tree! Satisfies your cat’s need to climb and sharpen her claws. Gives cats a place to hide- they feel safer up high. If you’re thinking about getting one, I’ve put together a comparison chart of some of the best cat trees available today. To buy one of the cat trees or read more reviews, just click its name and you’ll go to its Amazon page. Below the chart, you’ll find detailed descriptions and a brief review for each tree. This is one the highest-rated and best-selling cat trees on Amazon, and for good reason! This model comes in several sizes, heights and colors. The shortest one measures 77 inches high and the tallest is 80 inches high. All versions are quite tall, but the base is somewhat narrow. 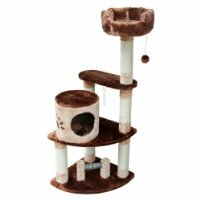 This is ideal if you want a tall cat tree with a small footprint–it’s great for apartments and condos. The Armakat trees look quite different depending on which one you choose. The 77-inch model has two hiding compartments, which is more than the other versions. It has six platforms, raised to various heights, which is good for both cats who like to jump high or ones that prefer to stay low. It has a carpeted ramp up to the higher level for cats that can’t jump well. At the top, two dangling toys keep cats entertained. There are two 78-inch models. The 32-inch long version has six platforms, one hiding cavern, a hanging rope and one dangling toy. The 42-inch version has a low-hanging hammock (ideal for senior cats), a sisal rope ramp, two hiding caverns, seven platforms and a hanging rope toy. This is the only version of this model that has the hammock. The 80-inch version has seven platforms, one large cavern, and a carpeted ramp, plus one hanging toy. All versions are available in beige, silver gray, or ivory. The platforms are covered in soft faux fur carpeting, and the poles feature tough sisal that cats love to scratch. If you own several cats, you will appreciate how many perches and houses these trees have. The Armakat can handle cats jumping up it at high speed. The tree may wobble, but it never falls over. This is a wonderful choice for cats of all ages. Older cats will like the lower perches and hammock, while young ones will have fun bounding up the platforms to reach the highest perch. 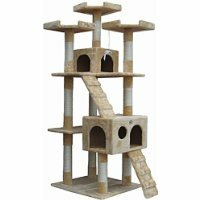 This 72-inch-high beige cat tree blends in great in any room of the house. It’s made of faux fur carpeting, sisal rope, and compressed wood. Including the base, the Go Pet Club has six perches. Three perches rest at the top. This is good if you’ve got multiple cats who might take turns vying for the top perch. Many other similar cat trees only have one top perch. The Go Pet Club also has two house caverns. The larger one sits near the bottom, and it has two doors and a window. The smaller one is up higher near the top perches. A white toy mouse dangles from one of the top platforms for extra fun. It also has two carpeted ramps that leap up to each house. This is good for senior cats who can’t leap up to the houses. This tree is capable of holding heavy cats without toppling over. One Amazon reviewer noted that her two 20-pound cats used the tree with no problems. It’s a definite perk for plus-size cats. The tree has a very fast assembly time. Two people can have this set up in about 10 minutes. At 55 inches, this is more of a medium-sized cat tree. It’s a good way to test the waters before upgrading to a full-sized one. The tree is a pleasant beige color, and it’s made of carpeting and sisal rope for scratching. The Go Pet Condo has one house cavern, two upper beds, and a circle-shaped perch near the base. It features an interesting curvy sisal scratching post on the side, plus three hanging balls next to the main cavern. Setup is quite fast and easy. Some parts even come pre-assembled, so that’s less work for you. This tree is very sturdy and doesn’t wobble when cats jump in it. The top perches have somewhat short sides, so they might not be ideal for large or overweight cats. Normal sized cats should be fine with this. One Amazon reviewer noted that small pieces of the carpeting material occasionally fall off and land on the base below. No other reviewers mention this, so it could just be an isolated incident. Overall, this is a good choice if you lack space or just want something that’s not too high. Most cat trees don’t look like a work of modern art. The Refined Feline Lotus Cat Tower does just that. It’s 69 inches tall and made of beautiful cherry wood. The tree features one cavern on the bottom, two center perches and one sloped top perch. There’s also a sisal scratch pad on the side. For extra comfort, you’ll find faux suede cushions on top the cavern and on the top perch. The cushion covers are removable and machine washable. If you read the Amazon reviews, you will notice several poor ones dated from 2011. This is because a model shipped that year had a factory defect. The defect prevented screws from aligning with the pre-drilled holes in the wood. Since then, the makers of the product fixed the problem, so you should not have the same issue with the faulty alignment. Due to this defect, though, it’s best not to purchase one of these used so you don’t inadvertently purchase an older faulty model. The Kitty Mansions Florence cat tree is a good choice for the money. It’s made of soft dark brown carpet and sisal rope scratching posts. 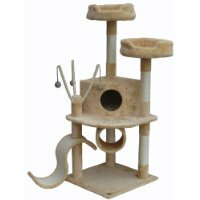 It comes with four total perches, including a super-plus top perch which cats seem to adore. Your cats will surely fight over this soft bed. Maybe they’ll even prefer it over your own bed! This tree has one mid-level cavern for cats to hide in. This is a good cavern for kittens and small cats because it’s not too large and the entrance is small. Larger cats may not enjoy the tight fit. The Kitty Mansion can be wobbly when cats jump on it, but that happens with pretty much every cat tree. Amazon reviewers say that the fabric is very soft and luxurious, and the construction of the tree is very good. 1. 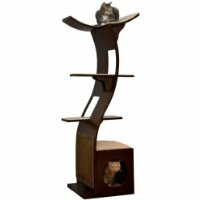 Space in Your Home- It’s easy to fall for a tall, beautiful cat tree…”My cat will just LOVE it!,” you say to yourself. And then, when you get it home, you find out it doesn’t fit well anywhere. Avoid this problem by measuring the room where you’d like to put the cat tree. The height is most important, but also measure the length and width of the area. 2. Color and Design- Cat trees come in several colors and many designs. Most are quite large, too, so it’ll be hard not to notice one when you stick it in a room. Consider the aesthetics and design of a room before buying your tree. If you have white walls, for instance, look for a tree that is also white or beige. Some cat trees, like the Refined Lotus Feline (see above), are so pretty that they’ll fit in anywhere. If you want something wacky, you can find cat trees that are covered in neon-colored carpeting or faux leopard fur. 3. Price- No matter how much you love your cat, you can’t forget about price. How much are you willing to spend for your cat’s happiness? Keep in mind that an expensive cat tree might not be as fun for a cat as a cheaper one. Read lots of reviews before you choose. You can get an idea of a tree’s average price by checking out my comparison chart above. 4. Perches and Cubbies- How many cats do you have? If at least two, opt for a tree that’s big enough to share. A good tree for multiple cats should have at least two cubbies for hiding, plus multiple perches at different height levels. Consider your cat’s age and climbing ability, also. Older cats can’t jump very high, and they will need a lower perch. Some trees also have ramps for easy perch access. 5. 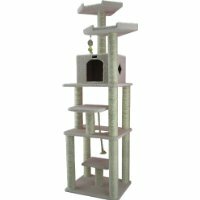 Materials- Most cat trees are covered with either carpeting or fake fur. Ensure that a covering is thick enough before buying it. If the fabric is too thin, a cat will easily tear it. The scratch posts should also be made of thick, high-quality sisal rope. Check reviews to see if other buyers have had issues with materials falling apart too easily. You might think your local pet store is a good place to get a cat tree. Not so! Why not? Well, firstly, the selection is probably extremely limited. Second, you’ll have to lug the tree back home in your own vehicle. Also, many people report that cat trees are more expensive in pet stores than they are online. To save money, time, and frustration, buy your cat tree online. Amazon is an excellent place to shop, and is very highly recommended by thousands of cat lovers. You’ll get your cat tree dropped off right on your doorstep–no lugging it home. Plus, most trees have free shipping, no matter how much they weigh! Click the name of any cat tree above to go straight to the Amazon page and buy it.